At the annual conference of Holocaust Survivors at Yad Vashem Memorial Complex. This post isn’t about photography. It’s about great people. Yesterday I was making just another photo session for my Holocaust Survivors project. At the gathering there was a guest. His name is Nikolay Ilyuchik. He lives in Belarus, in Bogdanovka village near Brest. He is fourty-something. When he was a child his parents were telling him about the local jewish people who were killed by the fascists during Holocaust. Neither monuments nor even cemeteries were made after the War by the local government to commemorate the tragedy. 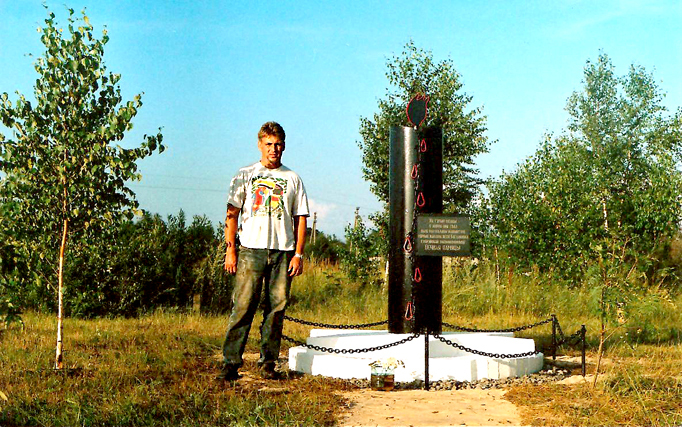 When Nikolay grew up he has decided to make a monument in memory of his killed jewish neighbours. Being a man of quite modest income he started to put aside finances for this project. He was collecting money during three years. Nobody wanted to help or at least listen to him. “Who were those jews? Were they really killed or it’s another speculation?” Nobody in the village even remembers their names. The local government not only didn’t help. More than that. Nikolay was told not to “stick his nose to this topic”. So he started building the monument for his own money with help of his children and close friends. And finally he has set up the obelisk at the place of murder of jewish villagers. But this wasn’t the end of the story. The authorities didn’t want to register the obelisk as an official monument. Moreover, they began to threaten Nikolay for “illegal capturing of the ground” on which the obelisk stands. I’ve seen Nikolay yesterday. I’ve looked at his open face, we greeted each other and his hand of a hard-worker gave mine a good squeeze. Bonhomme with natural impulsions, so pleasant to know that such persons still exist. Nikolay Ilyuchik with his wife Raisa. If you feel that you want to express gratitude to Nikolay by whatever means, don’t hesitate to call his friends in Israel for details: 02-585-79-89. 62 queries in 0,501 seconds.